The Latin America Regional Interactive Dashboard to 2019 provides capital expenditure and installations forecasts for each market sector within the offshore oil and gas industry, including: fixed platforms, floating production systems, subsea, SPMs, pipelines and control lines. For each market sector, capex and installation forecasts can be further analysed by: operator, country, water depth as well as by other key sector specific components. 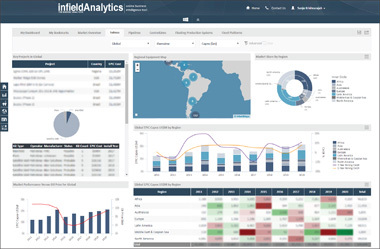 The interactive online dashboard enables clients to perform independent analysis on each offshore sector within Latin America. Navigational controls enable the user to immediately recompile the information shown according to their preference. This new management information system offers our clients the ability to subscribe to access a single quarter’s forecast for a period of 12 months, or to subscribe to this dashboard for a year to obtain quarterly updates. 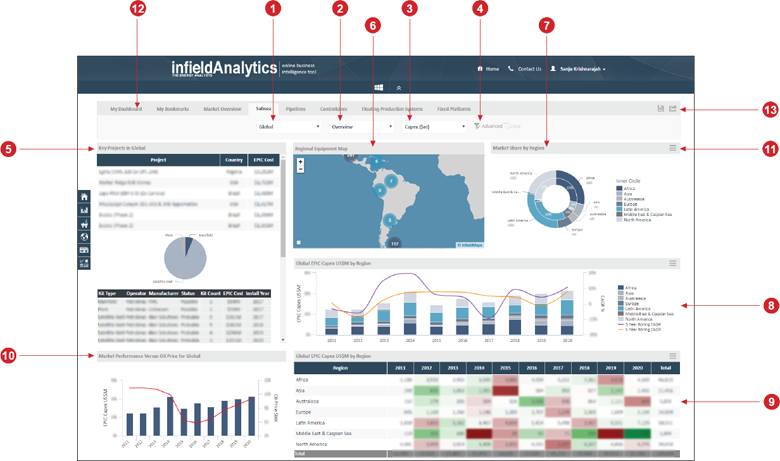 InfieldAnalytics is Infield Systems’ new online business intelligence dashboard application. This management information system increases the analytical value that our clients obtain from our reports and forecasts by delivering them via an interactive system that dynamically updates its views based on their choices; allowing them to immediately perform their own analysis. Clients can choose to access a single forecast edition or can subscribe to get quarterly updates. The InfieldAnalytics navigational controls enable clients to immediately recompile the information shown by: geography (global or regional), by sector (operator, water depth, platform type, etc. ), and to choose the metric (Capex or installation numbers). Additional chart filter options are available with the advanced subscription service. For more details about this dashboard please contact us. InfieldAnalytics is capable of delivering each new forecast edition as soon as it is compiled, so clients have access to the latest information based upon the current market conditions. Market Selection - this provides clients with the option to change the contents of the chart so that they can compare sector specific information, including: control lines, fixed platforms, floating production systems, pipelines, SPMs and subsea. Segment Selection - this option enables the user to segment the information displayed by country, by operator, by water depth and then by other market specific segmentations - for example, select platforms and a weight group segment would become available, or for pipelines diameter would be an option. Metric Selection - this enables clients to alter how information is compiled so that figures displayed correspond to either EPIC Capex (phased work year) or number of installations. Fixed Platform Equipment Map - provides an interactive geographical summary of installations. Market Share by Sector Selection - the inner circle represents 2010-2014 while the outer circle denotes the forecast (2015-2019). EPIC Capex/Installations by Sector Selection - provides an interactive ten year forecast (2010-2019) for either Capex or installation counts, overlaid by a 3 and 5 year rolling CAGR. Data Table for the Metric Selection (EPIC Capex in USD$m/installations) by Sector Selection - provides the summary data according to the selection criteria used. Market Performance versus Oil Price 2010 - 2019 - this chart plots oil price against forecast Capex for the chosen market. Individual Chart Menu - each chart has its own independent menu where users have the option to explore or export the chart and its data. Advanced Analytical Chart Filters - it is possible to purchase an advanced subscription whereby subscribers can filter the information displayed by a variety of additional options (time base, country, project type, operator, water depth group, weight group, etc.) to create their own bespoke charts. To obtain a quote for this option, please contact us. By subscribing to this management information system, your organisation agrees that it will not copy or allow to be copied in part or whole or otherwise circulated in any form any of the contents without prior written and specific permission from Infield Systems Limited. Our standard terms and conditions are available either upon request or at Infield Terms & Conditions. The quarterly updates are for chart updates only - commentary will not be updated. As such an annual subscription would include one full report update and 3 quarterly chart updates. Prices shown below are for the standard report service. For anyone who would like to discuss having the ability to filter the information displayed by a variety of additional options please contact us. InfieldReports may be purchased as a quarterly subscription and also as part of a package with our InfieldAnalytics service. Please complete the form below to highlight your areas of interest so we can provide you with the optimum solution for your needs. A member of the Infield Sales Team will contact you as soon as possible. Please note that all requests for quotes are without any obligation to yourselves. Your enquiry has been placed to our system. Infield team will response to your enquiry as soon as possible. The InfieldAnalytics dashboards are a scalable service and we can offer different packages to suit your information requirements. Please complete the form below to highlight your specific areas of interest so we can provide you with the optimum solution for your needs. A member of the Infield Sales Team will contact you as soon as possible. Please note that all requests for quotes are without any obligation to yourselves.